Perhaps nothing has better demonstrated the disconnect between consumer wants and the current state of network television than this summer’s Olympics. We all watched as Twitter and NBC teamed up and made it crystal clear just how out of touch old media is. Clearly, live television isn’t sure how to adapt and interact with our new communications systems. The great divide between the 21st century and network television doesn’t stop at its tension with social media. Search is another big, uncomfortable problem. While streaming services like Netflix and Hulu have implemented (to varying degrees) simple, highly visual hubs where you can find and discover content, live television is stuck in an excel-like hell. Anyone with a cable subscription knows that the TV guide channel and its excruciating roll are an exercise in torture not to be tolerated. And the channel surfing game of watching a show while bringing up the guide underneath is a barely improved alternative. Enter the second screen. The world of personal mobile electronics has long promised to unlock cable television’s potential, to finally introduce the very real benefits of real-time to TV. While a few apps here and there have socialized or simplified network programming, search and discovery remains an issue. Today Boxfish is officially throwing its hat into the ring after a soft launch earlier this year. 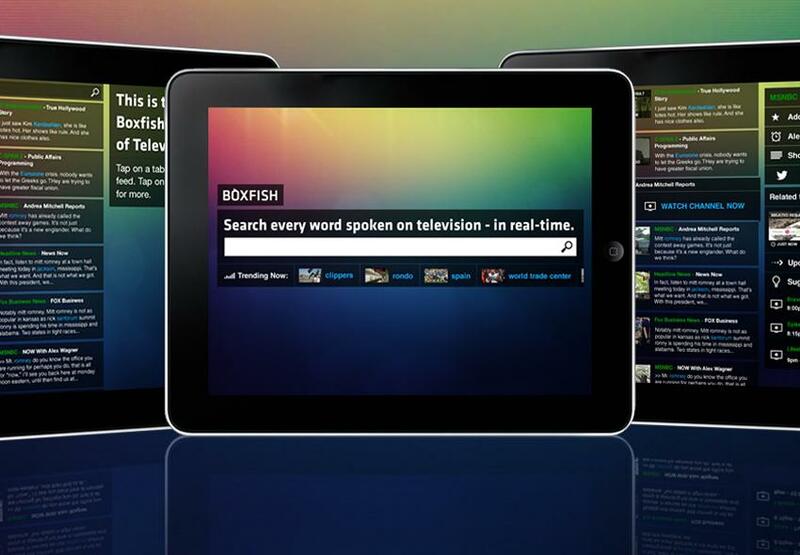 At the time, Boxfish fully revealed its plans: Capture every word being spoken on television, load them into its database, make it searchable via its app. But this first iteration was more or less a Web test drive, where we could search and discover television content, but the operation stopped there. Now, the Palo Alto-based startup is lifting the curtain off its official product, an iPad app that allows you to search for TV content in real-time and then acts as a remote, changing the channel to the results as you want to view. I had the chance to visit Boxfish headquarters in May, get my hands on an early iteration of the app, and talk to founder Eoin Dowling and Kevin Burkitt about Boxfish. Both emphasized the palpable and obvious frustration with the current system and the sad state of discovery – as well as how new user-facing technology was inching us closer to uniting how we consume the Web with how we consume television. The Boxfish iPad app allows search and discovery in a variety of mechanisms that are becoming increasingly familiar to anyone who’s ever used a reader app – which is quite a few people. Apps like Pulse and Zite, and to a greater degree Trapit and News360, have done some hard work for Boxfish by getting us good and familiar with personalized content services. The concept is being applied to television, of course, but the interface and features are familiar. The Boxfish Live Guide shows you a bar of currently trending television content, which can also be broken down by genre. Users can search and discovery what’s on by channel, topics, and words. You can set alerts, so every time “Lebron James” is mentioned, you get pinged with where you can tune in. Users are able to customize the feed to their liking, or simply keep tabs on what’s trending. This is all novel and interesting and a remote-addict’s dream, but it’s not Boxfish’s big sell – that would be its ability to directly integrate with your provider to control your television. The app won’t only act as a disconnected second screen, but as a remote that will instantly connect you to what it’s surfacing for you. Right now, it works with DirecTV and TiVo. And while Dowling tells me he “can’t name names,” more multi-service operators (MSOs) are on their way in the near future. “We’re working on deeper integration for DVR functionality with a few [MSOs],” he says, so that users can get alerted away from home and auto-record shows. Dowling gave me a demo of the app in action back in May, and it worked as promised. During the presentation, Dowling searched for a handful of terms, selected from the results, and immediately changed the channel to the respective show. The idea is to end channel surfing and get you into the shows you actually want to see. Boxfish Live is free today for iPad.